Eurostar, Fish, food, Paris, je t'adore!, Restaurants - let's eat chic, Trains, Travel - bon voyage!, Vive la France! Last summer, Monsieur and I enjoyed a lovely weekend with my Belle-Mère. Somewhat of a culture vulture, she took us to visit a medieval village called Provins. We parked up, bought our entry tickets for the village (yes, unless you lived there, you had to pay to visit) and hopped on one of those funny little white tourist trains which took us on the scenic route around the remparts, through a gate and into the village itself. Somehow we managed to miss all the decent performances that are staged about the village in summertime, but we did enjoy a lazy exploratory walk about the place, working up our appetite and working off calories pre-consumption. If you’ve read Epicurienne before then you’ll be familiar with how food-obsessed I am, not to mention my husband and extended family, so it shouldn’t surprise you to hear that the highlight of our afternoon in Provins was most definitely lunch. After humming and hahing about crêpes versus set menus in the various establishments around Provins’ main square, we settled on L’Hostellerie aux Vieux Remparts, one of the more established-looking options, with a lovely enclosed terrace where we could dine in pleasant shade – the sun was high and scalding hot that day, so the respite was welcome. We immediately set about ordering a good Petit Chablis and plenty of water. Playing tourist is thirsty work. With our drinks arrived a little amuse bouche of bread sticks (don’t be fooled – they look pretty but are total tooth-crackers), dried sausage and prosciutto. Bread rolls of different types were offered, but none of us managed to finish one. Too tough. Perhaps Monsieur le Boulanger had absconded to la plage for le weekend? Monsieur and I decided to follow the set menu, which gave two options for each of three courses. Belle-Mère ordered à la carte. 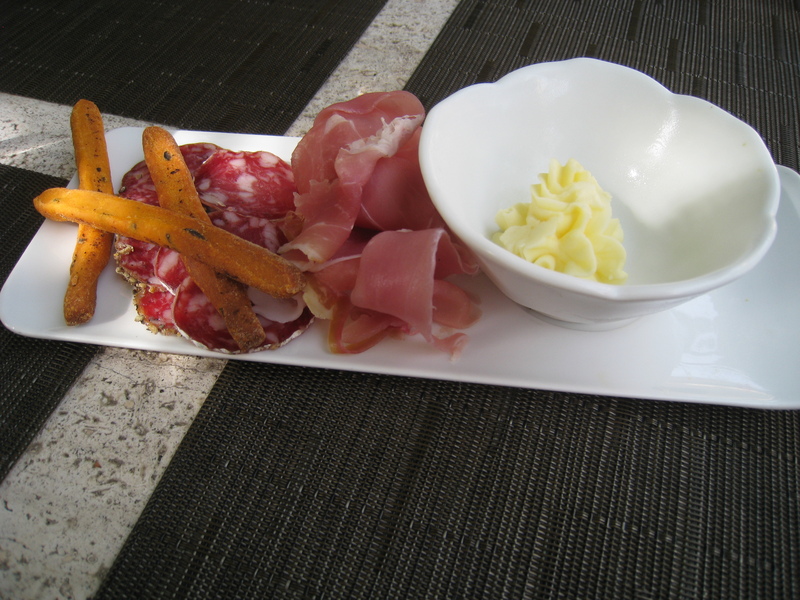 From hereon in, and notwithstanding the bread issue, the food was superb. 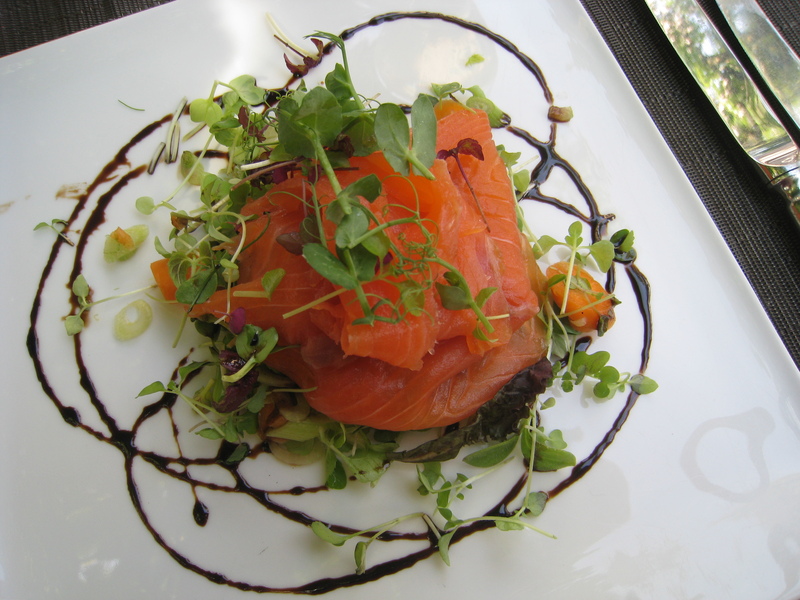 Our starters of quality smoked salmon, served in generous folds atop a selection of crunchy leaves and par-cooked vegetables, were excellent. A deft drizzle of balsamic completed the plate. As a main course I chose the pan-fried gilthead sea bream (somehow it just seems so wordy in English. 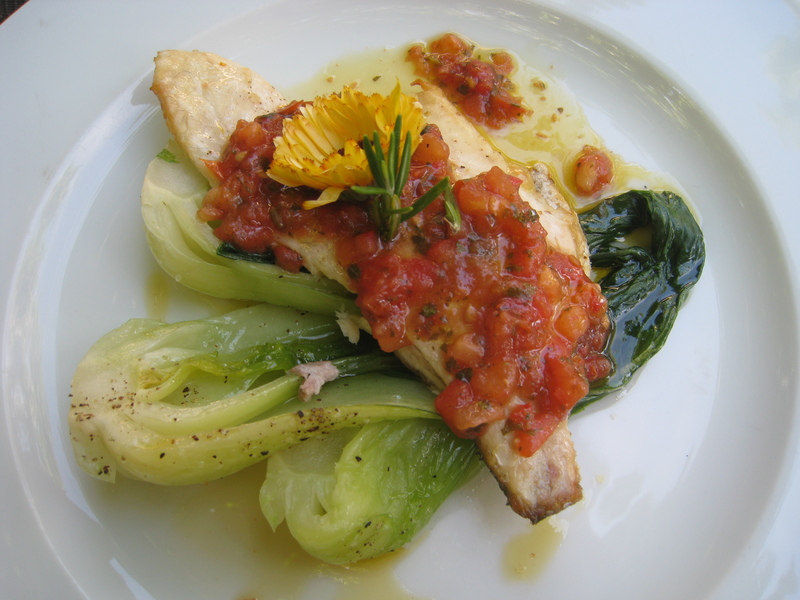 Let’s do it the French way and call it ‘daurade’) which was light and succulent, served on a bed of pak choi (which the people of Provins call ‘Shanghai cabbage’) with a lovely warm tomato salsa spooned across the top. This was a healthy, delicious lunch so far. 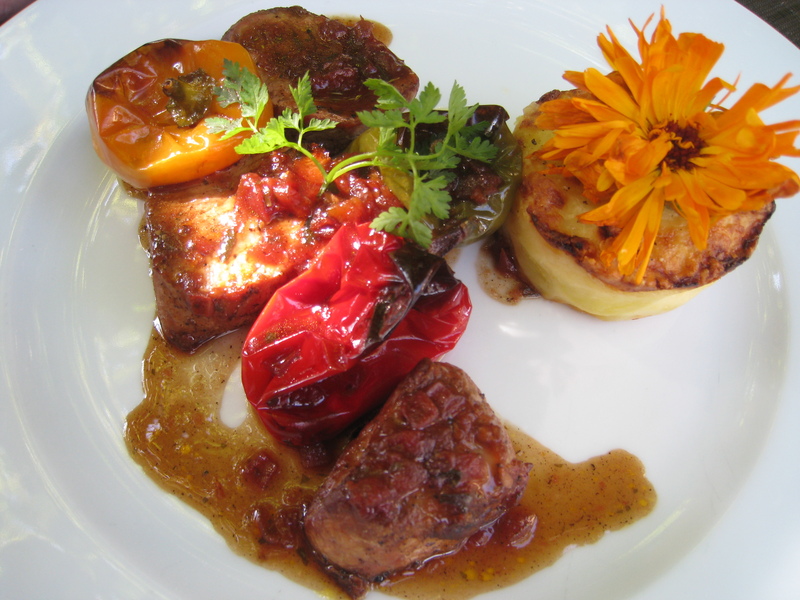 I also appreciated the way flowers garnished each of our mains – so pretty and perfectly appropriate as we were sitting in a terrace garden. Someone in the Vieux Remparts kitchen certainly believes in the importance of presentation and the detail was not lost on me. Monsieur thoroughly enjoyed his roast pork loin served with a confit of capsicum and a perfect round of gratinated potatoes. I wanted to pinch some of those beautiful-looking French spuds but Monsieur wouldn’t hear of it. Sometimes sharing is just out of the question. 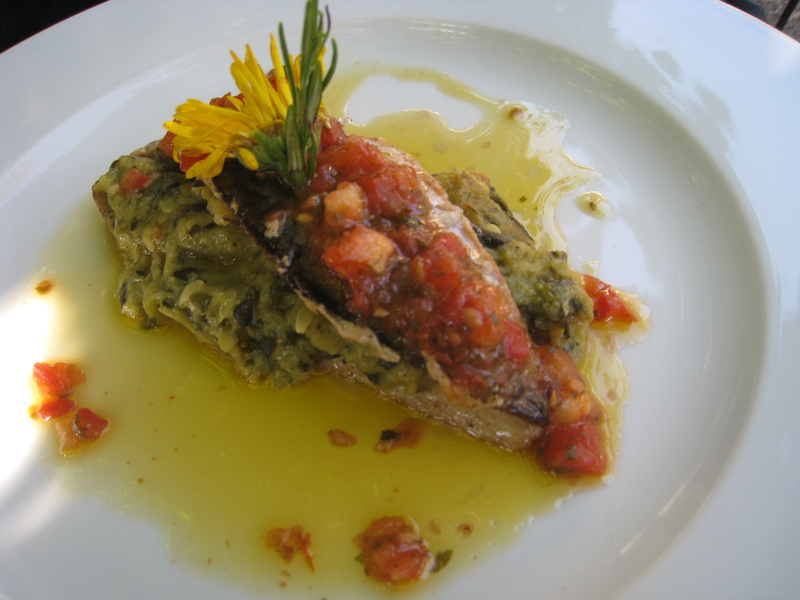 My mother-in-law had taken her main course from the main menu – sea bass on a bed of smashed greens, with a concasse of tomato and citrus sauce. We finished up by ordering the chocolate ‘moelleux’ (a small, soft ‘melt-in-mouth’ cake) with coffee ice cream. The squirt of something wasabi-like on the side was (we think) a sort of pistachio paste – really very good and quite dangerously more-ish. A quick coffee and we were on our way – well, almost. First we had to wait for the bill. When it didn’t appear after three requests, we went inside to pay at the till. 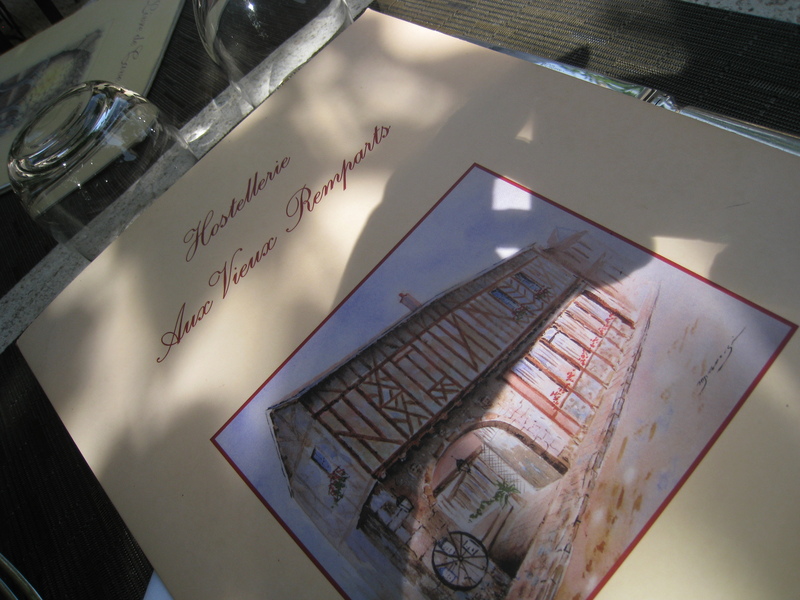 So, in summary, at the Hostellerie des Vieux Remparts in Provins I’d give them dix points for setting, neuf points for the food, but nul points for the bread and only quatre points for the inconsistent service. Still, bread and service aside, if you’re not in a rush this is a fabulous place to dine on a fine day (get there early and head for the terrace). I remember eating a lot of baguettes, spready cheese, and ham from the supermarkets when I went to France … all washed down with $1 red wine. It was good at the time, but I’d like to go back again and try some of this stuff! PR- we do plenty of the French picnic thing – baguettes, cheese, ham, dried sausage and a verre or two de vin… The simple foods are quality in France, just like the fancier ones, and often more beautiful because of their affordability and simplicity. Less is more.